Cocker Spaniel Rescue: Busting The Myths! Want to know why dogs end up in Cocker Spaniel rescue centers? Despite what some people think, it's not always the dog's fault. Here's everything you need to know to help you understand why some Cockers suddenly become homeless. the existing family pet had puppies which the family couldn't afford to keep. Unless you're a professional breeder, having your dog neutered is the sensible option! These are just a few reasons why Cockers end up in rescue centers. There are more many more, but as you can see none of the above reasons are the fault of the dog. Cocker Spaniel Adoption: Go Ahead, Make His Day! Cocker rescue centers have many abandoned dogs and puppies just waiting for the day he (or she) will be taken home to a loving family. Cockers that suddenly find themselves in a rescue center often become disorientated, frightened and confused. This could eventually lead to behavioral problems developing if they're not rescued and taken into a loving home. This situation is so very sad! Most of these dogs are just ordinary, normal Cocker Spaniels - they're not 'bad' dogs - they simply need some love, affection, and a little understanding. Stigma About Cocker Spaniel Rescue? Surprisingly there still seems to be some sort of a stigma attached to pet adoption. 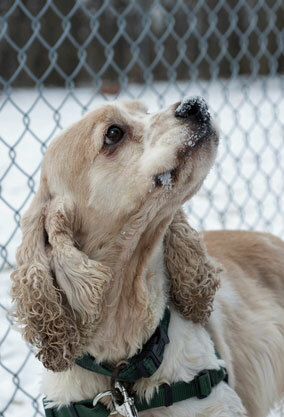 Many prospective owners believe that dogs which end up in Cocker Spaniel rescue centers do so for a reason. They often believe the dogs have aggressive tendencies, severe behavioral problems, or they may be just plain unlovable. They wonder why else would they be there and not in a loving family home? Well, the reality is quite the opposite! But, unfortunately, the stigma remains and many of these poor dogs either end their days in a rescue center or they're eventually put to sleep. Many Cockers are there as a result of family difficulties or because of their owner's lack of education or knowledge about Cocker Spaniels (or dogs in general)...not because they're bad dogs or have behavioral problems. Many dogs often end up homeless, and it's so unnecessary! All these animals need is a little loving care and understanding, and in some cases, perhaps a bit of training. Before you make any decisions, I strongly recommend you at least visit your local Cocker Spaniel dog adoption or rescue center to see what it's all about. You could help to redress the balance and adopt a dog from your local Cocker Spaniel rescue center. Many of our visitors have rescued a Cocker Spaniel and have lots of happy tails (sorry) to tell. If you've already adopted a Cocker, good for you! If you'd like to tell us your dog's rescue story, sad or heart-warming, we'd love to hear it. You can share it with us here. I'm 7 and for quite some time I have been wanting to have a small pet. It could have been a bird, a squirrel, a kitten, a puppy, even a teeny weeny fish would do! Or maybe more. One day my dad and I were walking when it started to rain. We were running to our car when we met a gentleman who took us to his shack. It was cold and raining. When we entered the shack I was horrified to find a small puppy tucked under some cold, wet, hay. He looked miserable and he was cold and shivering. I felt very sad for the puppy and made up my mind to take him home. I was able to convince my dad to let me keep it and I took the puppy home. It was night-time and it was very cold so I gave him some bread soaked with warm milk. He gobbled it up, snuggled up in my arms, and went off to sleep happy and contented. This is my Cocker Spaniel rescue story - I hope you enjoyed it. I rescued George from somewhere in London. I can't remember where as it was 8 years ago. George was POORLY trained and he had been abused. Eleanor (my child), Chris (my husband) and myself went to have a look around an adoption center. We were told that George was beaten and nearly died and had been left at the side of the road! Apparently, this very kind couple coming back from their honeymoon saw him lying at the side of the road and decided to stop and pick him up. He was wearing a collar so they knew he was called George, but on the other side it had written, I don't want George back. So the couple picked George up and took him to the Cocker Spaniel adoption center. We had just moved to London from America, and we wanted a dog to keep ours company. So we had a look around and Eleanor fell in love with George. Chris liked this dog called Tilly, who was a Springer Spaniel. So we took both of them! George has grown up to be a great dog and has a lot planned. He is now 10 years old and is still looking fit and healthy! And he loves playing with my children (I had another child called Harry). They all get on so well, so don't think rescued dogs are going to be horrible and badly behaved. Please save dogs, what did they ever do to you? We decided to adopt a cocker spaniel rescue to keep our little girl, Maggie, company. 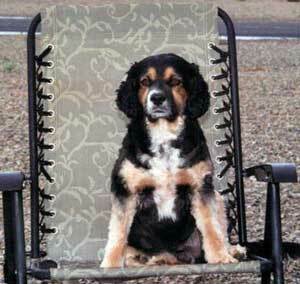 Maggie was raised with two sisters who have both gone to the Rainbow Bridge. We found Oldies But Goodies Cocker Spaniel Rescue and fell in love at first site with Oscar, a 5 year old tri-colored boy. It is true that they are scared at first, but in no time he has become one of our children and a loving member of the family. This has been the best experience I have ever had: no dealing with the usual puppy stuff that is very difficult when both doggie parents work. If you want unconditional love, rescue a cocker, you will not be sorry. Two months before my husband passed he agreed we should get a dog. 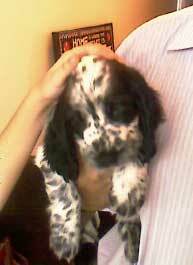 He wanted a spaniel like the one he had as a boy. Every two weeks we went to local shelters to inquire about any spaniel breeds, but we were told repeatedly by these shelters they never had spaniels. He wanted a male and it would be named Brownie Jr. no matter what color it would be since his childhood dog was called Brownie. When my husband passed away it took me two weeks to get affairs in order. When I went on-line I noticed a mixed spaniel in one of the local shelters that repeatedly told us they never had/have spaniels. I found out that this particular spaniel was in this shelter the same day my husband passed and was there for two weeks. I checked "Brownie Jr." out and we instantly bonded. I have been blessed with "Jr." for a lovely 2 1/2 years now, a Cocker/Cavalier King Charles mix. Now I'm looking for a playmate for him. I am a full-time RVer and within the next year I plan to move into an apartment. I walk him two times daily and he loves socializing with other dogs from my family and friends and at the dog park. I think my cocker spaniel rescued me! My cocker spaniel rescue story is this. Monnie came into my life when he was about 9 years old, his previous owner having passed away. He'd been left at an RSPCA shelter, and had severe behavioral problems (separation anxiety). He had been with another family prior to my meeting him, but they just couldn't cope with him. So, they brought him back to the shelter. Yep, old Monnie could certainly bung it on, but he settled into our routine, with the help of our two other old cockers (who now have since passed on - very sad). Well, now he is my constant companion and a great comfort during times of stress, but old Monnie is now 13 and slowing down - I guess I won't have him much longer. Still, it's been great to have given this old gentle dog a loving, warm and comfortable home, and the rewards have been great. My cure to losing a great old mate (and so far that is about 7 cockers), is to get out there and get another. For me, Cockers are simply the best! If you'd like to hear more of our visitors stories, and see some of their rescue dogs, simply scroll down to the bottom of this page and click on any of the titles. 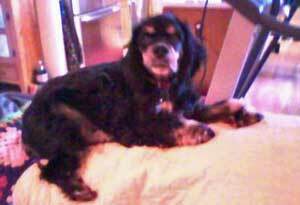 Do You Have A Success Story About A Rescued Cocker Spaniel? If you have a great story to tell, why not share it with us? For our American visitors, this Cocker Spaniel Rescue site may have something for you! And for our British visitors, here's a list of rescue centers in the UK, alternatively, you might like to visit this site. It re-homes cockers and springers. Cocker Adoption Not For You? If you decide that Cocker adoption's not for you and that you'd rather buy a puppy from a breeder, or you've been unable to find something to suit you and your family, then I recommend you read our pages about getting a puppy to help you get the best out of it. When you're ready, you can search for a breeder in your area by using our Breeders Directory.